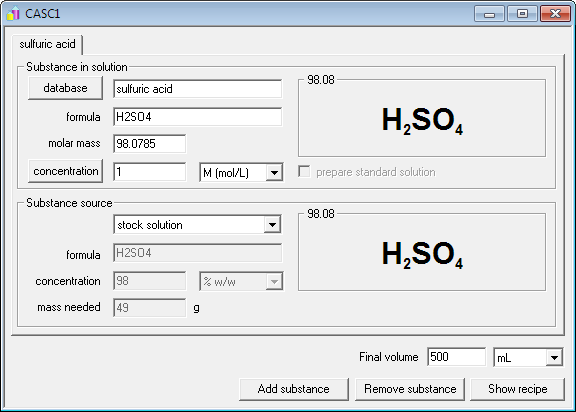 Solution preparation with CASC: how to prepare 500 mL of 1M solution of H2SO4 using stock concentrated acid? Question is easy, but calculations are tedious - to be reasonably precise you have to check molarity or density of the stock solution in the handbook. 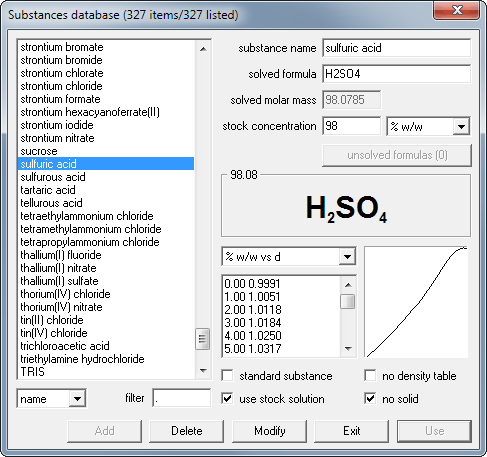 CASC has density tables built in so the recipe will be ready almost instantly. Start new solution, clicking on the New button on the tool bar. Solution preparation window looks exactly like the one you will see below the database window (scroll page down one picture if you want to see it now), just all fields are empty. Scroll down the list to find sulfuric acid. You will not need to scroll if you are using trial version as it has only ten substances in the database. Double-clik sulfuric acid on the list. It will be copied into solution window. Enter 1 into the concentration field and 500 into the final volume field. Ready! Click on the show recipe button. You may follow the procedure now, or print it for further reference. Note that density of the concentrated sulfuric acid was taken into account, and that necessary volume displayed in the recipe respects accuracy of entered concentration. More information about accuracy of calculations and number of significant digits used for results displaying can be found in the help file accompanying CASC. 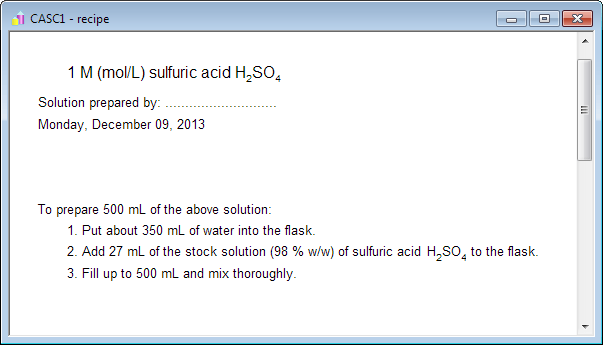 Defined solutions can be saved to disk to be reused later, or to be shared with others - you may download sulfuric acid 1M solution file as prepared above to see for yourself. If you want to add substances to solution, or if you want to dilute the other solution of sulfuric acid, it's all just a click away! Select other examples to check how to convert between concentrations and how to calculate concentration of mixture of two solutions. You will find even more examples in the tutorial being part of the help distributed with the CASC and is available in both registered and trial version.